Looking for a good copywriter? Let me show you my work. I have lots of experience working with some of the biggest and best ad agencies and clients in the business. Now I’m a freelance writer and consultant offering my experience and creative skills to help you communicate about your company, your products and your services. Today there’s no time for anything less than fast, clear and persuasive copy in ads, commercials, brochures, direct response packages, press releases and web sites. 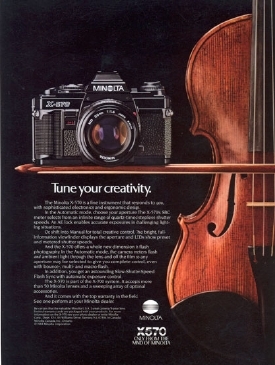 Minolta had just developed the world’s first auto focus SLR camera and wanted to introduce it as effectively as possible. The agency recommended using a name instead of numbers to I.D. the camera. The very successful launch included TV spots, consumer and trade ads and collateral materials. Later, the interlocking XXs in the Maxxum logo were unlocked at the suggestion of Exxon. There’s nothing more exciting than getting a new account, especially one as large and prestigious as the Travelers. At our get-acquainted meeting we learned that a B2B ad was needed immediately – like tomorrow. The objective was to tell the risk management folks about all the training, support and service they receive after their new computer hardware and software arrives. 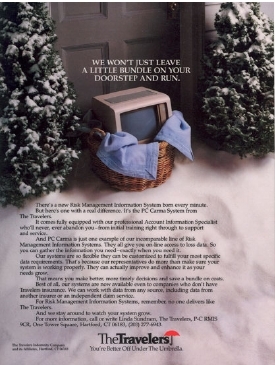 The next day the comp layout for the ad was on our new client’s doorstep. 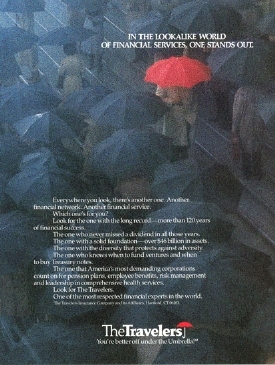 We learned through research that the red umbrella was better known than the Travelers’ name. So we reintroduced the Travelers’ red umbrella in a massive print and TV campaign. This magazine ad was photographed on the set as we shot the TV spot. 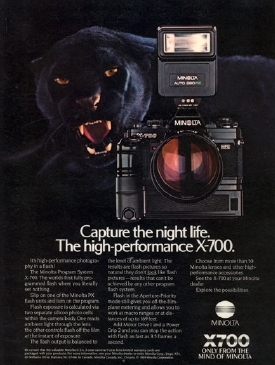 Before Minolta had the Maxxum, it had the X-700, a sophisticated SLR that was easy to use. 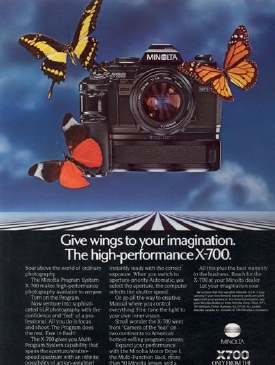 With this ad, I like to think, the X-700s flew off the shelves. 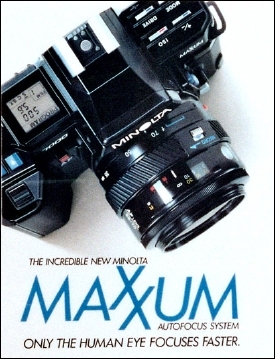 Here is another ad in the pre-Maxxum series, this time for the Minolta X-570. This is for the X-700 with flash attachment. Should you ever run into this panther while you’re all alone on a dark night, don’t worry. His name is Dusty and he can be bought off with chicken parts. 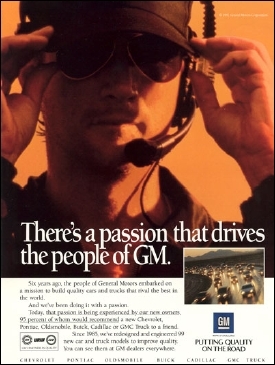 General Motors suffered a gap in perceived quality versus actual quality and they wanted an agency to help bridge it. It took three months of bouncing between New York and Detroit to win the account. We were given hardly more than a month to produce it. Ninety-five percent of the “Putting Quality On The Road” campaign was in TV. But the remaining five percent made for a pretty good print campaign. The photo for this magazine ad was taken from a frame in one of the six commercials produced the first year. Here’s a car ad from an earlier era. The Jaguar V-12 roadster was the smoothest, most exhilarating car my right foot ever experienced. 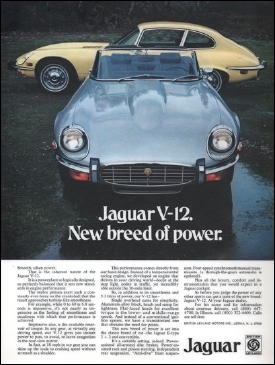 Although I had to go all the way to the Jaguar factory on Brown’s Lane in Coventry, England, to get the input for the copy, it was worth it. In fact, I’d do it again, and again, and again and . . .
All ads shown are copyrighted by the wonderful clients who paid for them.